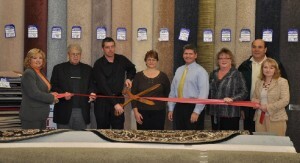 FULTON, NY – Members of the Greater Oswego-Fulton Chamber of Commerce celebrated the grand opening of the newly remodeled Onondaga Flooring showroom in Fulton. Located at 900 S. First St., Onondaga Flooring offers a wide section of all types of flooring including hardwood, laminate, tile, vinyl, area rugs, and carpet from manufacturers such as Mohawk, Armstrong, Congoleum and more. Onondaga Flooring is open Monday through Friday 10 a.m. to 7 p.m. and Saturday 10 a.m. to 4 p.m.
For more information, call (315) 598-9190. Pictured from left are: Lisa Gray, member sales and services associate with the chamber; Fulton Mayor Ronald Woodward Sr.; co-owner of Onondaga Flooring, Michael Perry; store manager, Madeline Pittorf; co-owner, Scott Perry; chamber board member, Barb Bateman of Alliance Bank; president of the chamber’s board of directors, Tom Greco of Fulton Savings Bank; and executive director of the chamber Beth Hilton.